Ulster Bank/RBS Global Restructuring Group: What Next? Eight years on from the financial crisis of 2008, and for many businesses and individuals who had ties with Ulster Bank, the crisis is still ongoing. Ulster Bank’s parent company, Royal Bank of Scotland, set up their ‘Global Restructuring Group’ in the wake of the recession to assist struggling businesses, with the premise of placing borrowers there on a temporary basis until normal service could be resumed. In reality though, businesses placed in the GRG continued to struggle, with many eventually failing and going into administration. Business owners reported that their businesses were valued at an unrealistically low figure by the bank and, once moved into the GRG, were put under serious pressure to sell their assets to repay loans. In 2013 the actions of the bank in regard to small and medium businesses came under serious review. Investigations suggested that RBS had intentionally moved businesses into the GRG unit in order to profit from their losses. By forcing the sale of customers’ assets, they could in turn reduce their own balance sheet – a move that has since been labelled as a “dash for cash”. Although RBS have admitted to letting their customers down, they have denied intentionally causing businesses to fail. This stance has also been reiterated by the FCA, who have now cleared RBS of allegations – a decision that has met with uproar from affected business owners. 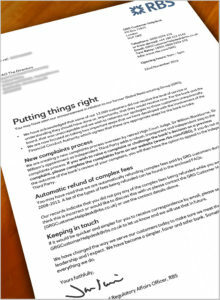 In November 2016 RBS announced to customers via letter that they were committed to ‘putting things right’, and to that end were introducing a £400million compensation scheme. The scheme will automatically refund around 4000 customers who paid ‘complex fees’, ie: fees that were not explained correctly or were mis-sold. However the finer details of who will receive refund and what the criteria will be remain vague at the moment; similarly claims made for refunds or compensation will be restricted to insolvency practitioners for the businesses. An official complaints procedure will also be setup and overseen by a retired High Court Judge. It has since been revealed that the complaint process will not be open to those who have lost their businesses, nor will they be eligible for claiming back on complex fees. The terms imposed on both the compensation scheme and the complaints procedure will restrict many affected individuals from achieving any type of closure. The reparations being introduced by RBS are limited to say the least, and unfortunately can do little for those individuals who have lost their business and whose livelihood was affected as a result. In Northern Ireland our small and medium businesses are at the heart of our industry; protecting them and assisting them is key to the future of the economy. Our Commercial & Finance Teams, including Director Gordon McElroy, litigation expert Jonathan Jackson, and insolvency specialist David McAlinden, will provide legal assistance, advise on your individual situation and offer possible resolutions.